There’s alot going on this week. My team is at MUFSO. New customers to focus on. MonkeyMedia Software is working with Rosati’s Pizza now. Helping them to get their catering program aligned amongst franchisees and franchisor. Educating their team members, with catering certification and of course, implementing some great software to help them support the program. Rosati’s is an amazing brand. Lot’s of history. 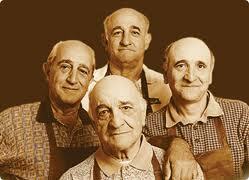 A wonderful family business now being managed by its 5th generation of Rosati’s. A true Pizza empire. Here’s an old shot a few generations ago. This photo really got me thinking about the old days. What it must have been like when life was a bit slower. Not easier, but certainly slower. Was it better? I don’t know if it was, but certainly it was slower. I recently had the good fortune of meeting much of the Rosati family and now I understand why this brand has had so many generations of success. Deep commitment, solid core family values and just good people. After all, it’s the people that make a company so great. This family understood that it was all about community. Once you get inside, you can see how each generation has fought hard to stay on top. The vision has changed. But it needs to in order to survive and be strong in the long run. So, this got me thinking. About our film project. Back To Basics – The Future of the US restaurant industry in a Global Economy. This film project is getting support from amazing people in an amazing industry. I spent some time this week asking myself why this project is resonating with so many people? Sure, we’ve got support from the National Restaurant Association and Coca-Cola. Why? We’ve got leaders like Ed Rensi, Jon Luther Sr., Ron Shaich, Ari Weinzweig, Paul Mangiamele, Al Bhakta, Carin Stutz, Roz Mallet, Dawn Sweeney, Kat Cole, Don Fox, Jim Vinz, Peter Romeo, Chris Lowe and Darren Tristano. Sure we are committing all of the net proceeds of the film to Prostart under the National Restaurant Association Education Foundation. All of these elements make for a wonderful and powerful project. But, that’s not enough. We have to deliver a compelling story. Something that will resonate with the general public. The restaurant industry employs 13 million workers in the US. The restaurant industry represents a land of opportunity. Just look at the Rosati family. Immigrants who came to the US with very little. Through hard work and dedication, they built a future for their grandchildren and today employ hundreds if not thousands of people. This story of immigration, hard work and building a future is the backbone of so much that we all have to be grateful for. That’s what is so compelling. We have to continue to tell these stories, to keep them alive and tell them again and again. We need to try and put the essence of this success into a bottle, a syllabus if you will, so that we can teach future generations the characteristics of entrepreneurial success. At the same time, we need to teach future generations how to be better business managers. How to utilize the public markets at the same time not selling their souls for money and greed. They need to be responsible. We all know that money does not come easy. It’s scarce and as a community we need to manage it responsibly. After all, collectively, the restaurant industry handles more than $630 Billion per year in the US alone. That’s alot of cash. We can either be responsible or reckless, the decision is ours. So, I was really trying to get my mind wrapped around this whole idea. What is “going back to basics” all about? It’s frugality. It’s simplicity. It’s logical. It’s community based. Basic works. It always has, and always will. We’ve got to focus on the core and basic elements. Then, I found this Allstate commercial. Ok, it’s a television Ad. But, it speaks some truth. I especially like the part where the narrator suggests that we need to go back to basics after each recession. Allstate has survived 12 of them. So, I thought I’d post the video here. If Allstate can survive 12 recessions, then why can’t the restaurant industry? It’s in your hands! Enjoy your Saturday. Well, as many of you know, my team at MonkeyMedia Software is working on a film called Back To Basics. It started as a simple idea really. Inspired by my learning as an entrepreneur navigating the complex boardrooms of America’s largest restaurant corporations. The story line is real. It comes from personal experience. Lucky for me, the storytellers in our film agreed. The premise of the story is compelling. Really compelling. Because as our restaurant corporations are focused on increasing short-term share value, our managers have boxed themselves in. A focus on short-term share price forces short-term thinking because the financial markets always respond positively to short-term profits. And so, because our boardrooms are populated with highly trained business sharpshooters who are great at applying formal business academics, we may be creating a “disconnect” in our organizations. This “disconnect” is causing an imbalance in our boardrooms. The entrepreneurship that lives at our restaurant unit level must be recognized and nurtured. Our restaurant community must hold responsibility to make sure that as we pursue emerging markets in other parts of the world, we in fact invest in our people at home, at the restaurant level, so that they can join tomorrow’s leaders at the highest level of our corporations. This will result in a healthier perspective in our boardrooms of the future. The reason we need that is to make sure we compete fiercely at home in our mature markets as we expand globally in emerging markets. We cannot do both without putting a plan in place for our young entrepreneurs who simply have not had the opportunity to be formally trained in business. If you would like to read the long version of the film’s premise, please visit the website for the film. All the net proceeds from this project will be donated to the NRAEF. I saw the video below and it really inspired me today. I hope you enjoy it too!